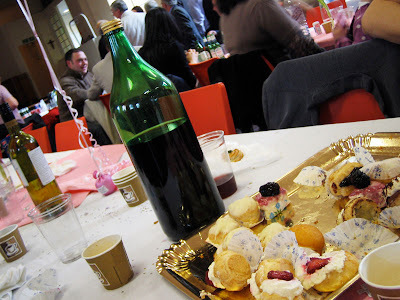 I went to this really great Italian baptism the other day. Baptisms are a pretty big celebration for us and how do we celebrate best? Eating! I loved the set up of this "little Italy" in an English church hall; traditional homemade wine in gigantic bottles, baked aubergines, huge terrines of meatballs, platters of Parma ham, turkey escalopes, two whole salmons, grilled peppers all made by hand and with love by the family. Wonderful. Growing up on these huge eating feasts I thought I had it in the bag this time by selecting a modest plate of food. Then I saw the dessert table and proceeded to eat a cheese board, a pile of profiteroles, strawberries and a huge plate of tiramisu. Then they brought out the traditional pastries as shown in the picture above (from Zingarella's Patisserie in Brighton, I think.) Look - they are in arms reach for god-sake! What chance did I have? Although I must say my father was guilty for the disappearance of a good quarter of those! Then they cut the baptism cake. How may desserts is that now? Mr Graphic Foodie even said I had tiramisu breath!